We wanted to like Art School Confidential, the new Dan Clowes/Terry Zwigoff movie, more than we did. 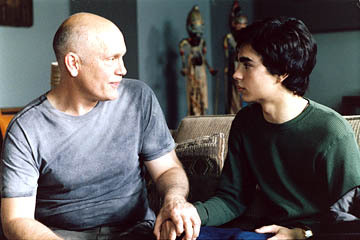 After all, the supporting cast (Anjelica Huston, Jim Broadbent, Steve Buscemi and John Malkovich) could certainly live up to Clowes' usual kooky cast of characters, lead Max Minghella is easy on the eyes and Cinecultist loves pretentious art school students as much as the next urban dwelling bohemian. However, this movie didn't have the spark that it needed to come together as a compelling film. Instead it was just a hodge podge of good intentions and half-baked jokes. Maybe the problem was the Rilke-esque plot structure. Young poets or artists trying to make it big are sweet but essentially annoying, whining, self-indulgent characters. We want them to be able to rise above their own naive ineptitude but that process can be painful nonetheless. Minghella's character Jerome longs to be both a great artist and have a beautiful girlfriend but the way he goes about it with the nervousness and the cool guy yet not posturing is painful to watch. Maybe the Cinecultist doesn't really "get" what it's like to pine for a girl who likes the dumbest guy in school but this hardly seems like the high drama Art School Confidential makes it out to be. All of that would faux pathos be palatable if only the jokes were funnier. The crass film student gets his funding from his grandfather, who wants to see a horror film about a strangler with shooting in it. A cute art school girl alternates between sobbing and laughing hysterically as Jerome tries to make a move. A pretentious art prof makes paintings with only triangles in them but says it took him years to learn to paint like that. Ha. But not so genuinely funny or real. Still Sophia Myles, as the dream girl Audrey, is lovely and Max has some intriguing eyebrows. Next time will be better for our friends Clowes and Zwigoff, surely.